In the run up to the election in Israel a single event that occurred on March 17 can seriously affect the whole race. Israeli Foreign Minister and the leader of Israel is Our Home right-wing nationalist political party, Avigdor Lieberman, while attending a meeting with his potential voters in the city of Herzliya situated at the Northern part of the Tel Aviv District, expressed his radical anti-Arab views, by claiming that: “Those (Arabs) who are with us deserve everything, but those who are against us deserve to have their heads chopped off with an axe.”- reported Newsweek magazine. Such a demonstration of flagrant racism was thoughtless at best since today Arabs constitute 20% of the Israeli population. 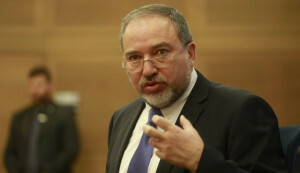 Yet, it seems that Avigdor Lieberman wasn’t quite satisfied with his boldness since he went on to say that he would gladly“donate” Umm al-Fahm – the third largest Arab city in the country to the head of the Palestinian Administration, Mahmoud Abbas to let him raise the black flag there on ‘Nakba Day’ (Day of Catastrophe). ‘Nakba Day’ is the Palestinian day of mourning that is held on May 15 – the next day after the establishment of the State of Israel, as the anniversary of the exodus of 700,000 Arabs who lost their homes and savings in just one day. At the same time, it should be noted that this wasn’t the first time that this Israeli “chief diplomat“ made such racist statements. In February 2008, Avigdor Lieberman urged Jewish political parties to cleanse Arab factions from the Knesset (Israeli parliament), which resulted in the members of the Palestinian National Liberation Front announcing their intentions to kill the leader of Israel is Our Home. Last November Avigdor Lieberman announced his proposal to pay financial compensation for Arab citizens of Israel, should they agree to move to the Palestinian territories. As for the citizens who despise anti-Palestinian Israel’s policies, this ”chief diplomat” believes that they should face death row. Due to Avigdor Lieberman, the official program of Israel is Our Home states that capital punishment should be introduced for terrorists. As for the regional settlement, Lieberman and his party believes that there is no local conflict between Israel and the Palestinians, instead there’s a global Arab-Israeli conflict. For Israeli right-wing nationalists it’s a three-dimensional conflict – with the Arab countries, the Palestinians and Israeli Arabs. In this context, any future negotiations should include two important conditions: a) the exchange of territory and population; and b) global regional arrangements. In addition, Israel is Our Home demands the explicit position of the future government of Israel be that Hamas in the Gaza Strip should be overthrown by any means necessary. Lieberman is the only Minister of Foreign Affairs in the world that does not live in the country that he’s representing: he dwells is in the Israeli settlements in the occupied West Bank. In light of the above stated facts and the overall racist position of Avigdor Lieberman against the Arab population, there is little hope for him and his reliable ally Benjamin Netanyahu to find any kind of electoral success among the Arab population of Israel. So the opinion polls that have recently been published by a number of Israeli newspapers reflect the situation on the ground, Israel is Our Home will only get 5 seats out of a total of 120 seats in the Knesset, while Likud may be getting a bit more – 22. As for the possible highest number of seats for a single party – the center-left bloc “Zionist Union” headed by Tzipi Livni is positioned to be the absolute leader with 25 seats in total.